I remembered some interesting salads in one of the issues of Food Network Magazine I had laying on my coffee table. Sure enough, there were two recipes, one creamy-style from Aaron McCargo Jr. and one vinaigrette-dressed from Paula Deen. Both looked good, but not perfect. I tend to prefer creamy style potato salad over vinaigrette dressed but I don’t particularly like mayonnaise (or, to be honest, the calories that come with it). So, I used my usual 70-30 mixture of sour cream and mayo. I took the best components from each: bacon from Paula’s, eggs, Worcestershire and hot sauce from Aaron’s, then whipped up my own take. For a first attempt, I’m in love. The spicy kick from the hot sauce is perfect and there’s plenty of crunch from the bacon and green onions so I never missed the celery (my husband really dislikes celery) common to the ones I grew up with. Plus, the Worcestershire, an addition I thought was odd (but intriguing), added unexpected depth. It technically serves four, but it never made it past the evening. We wound up having it as dessert later on. 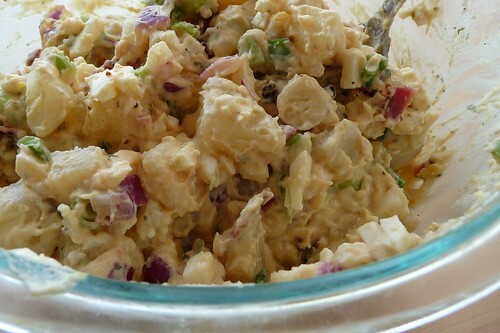 Now that’s some good potato salad! Chop up potatoes (peeling first, if desired) and add to boiling, salted water. Drain, allow to cool. Combine with remaining ingredients and stir well, adjusting quantity of sour cream and mayo to your taste. This entry was posted in american, dairy-free, gluten-free, recipes, salad, side, snack, untranslated. Bookmark the permalink. Don’t like garlic? *gasp! * ;-) I wrote it in as optional because it’s an oddball sauce that I found while on vacation and can’t replace. I do also like to add a bit of hot sauce to make it spicier – but that’s me. I use garlic in recipes. But sometimes if it asks for 4 cloves of garlic, I will use only 2 or 3. But that’s weird, I love garlic bread.